My current favorite pen in my rotation is a Sailor Professional Gear Sapporo Slim in pearl red with silver accents with a Saibi Togi nib. It writes with a super fine line. Though if needed, you can flip it over and get a fine-medium line out of it. Many reviews have said it’s scratchy and difficult to write with. It’s a matter of having a light hand. 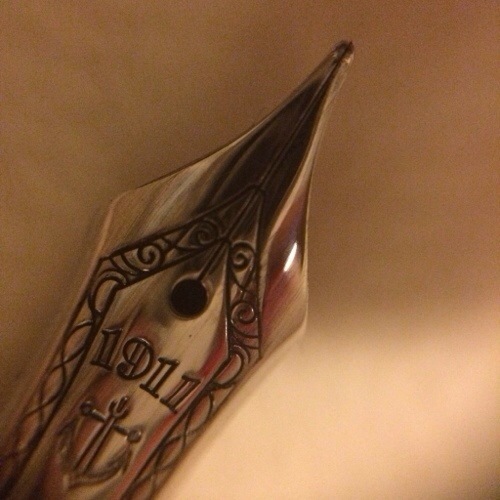 If you’ve used technical pens, this will be a joy to write with. It gives you a line that’s very similar to a 0.1, without the fragility. I’ve had to replace many 0.1 tips in my old tech pens, but this pen has been with me for 1.5 years. And it’s still writing as well as when I first got it.